There are many educational apps available at App Store that will help & assist teachers in educating students providing information on learning various subjects just on the palm of hands. iPhone and iPad can be a useful tool in inspiring you with new ways to teach, helping you keep your information organized, hours spent outside of the classroom writing lectures and devising lesson plans and ensuring that you stay on top of teaching assignments. Here is a list of five iPhone/iPad apps for teachers that they can use in the classroom for teachers. TeacherPal is a teacher’s personal manager that helps to record the class data. It enables the teacher to manage classes using the simple and intuitive chalkboard user interface. TeacherPal allows teachers to record the attendance with a simple tap. This app also keeps track of grades and behavior of students. It feature adding students from contacts, manages the timetable for any class, and adds notes to your lessons. 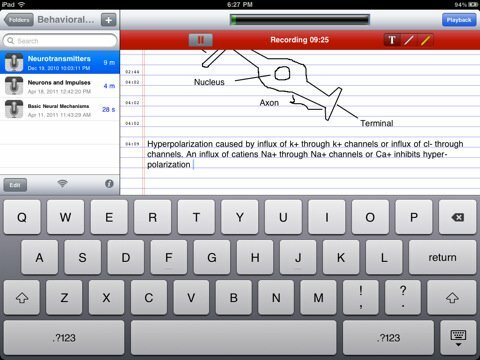 The best note taking app in the App Store with synchronized note and audio recording. It automatically indexes lectures, meetings, interviews, conferences, talks or study sessions by synchronizing audio and notes. It allows you to add text or annotations while recording and then during playback simply touch the drawing or text and you will immediately be taken to that context in the recording. You can save your time in searching through the entire recording to find out. You can export notes and audio recording via email, over Wi-Fi, or through iTunes. If you are sharing the recording over a Wi-Fi connection then you will be offered with the address where you can download an HTML document with text file, drawings, PDF or an audio file. This simple app allows you to take and keep track of attendance. With this application you can count down the days left in your semester or the hours until summer vacation. It’s mainly useful for teachers to keep track of records for their classes, meetings and group gatherings. 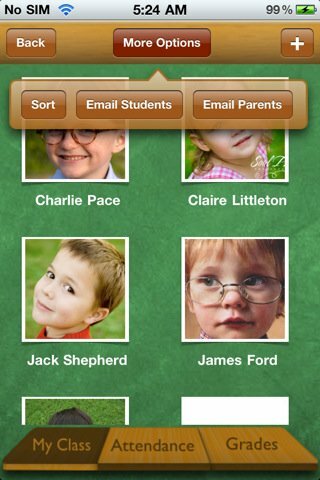 You can easily sort students by first name, last name or even manually re-order students to match a seating plan. You can completely customize the attendance statuses e.g. present, absent, late, excused etc. You can export the attendance data and import names a number of ways including formatted CSV files to your Dropbox account or you can email the database to students’ parents. It is the first iPhone app that can call itself a true gradebook for teachers. This app has many features that a teacher desires and it is created by group of teachers for teachers. iGrade for teachers help teachers to keep track of grades, notes, attendance, statistics and info pages. It provides advanced capabilities to analyze and report your grades. iGrade give you direct access to grades, notes, attendance, statistics and all the functionalities you need to take control of the information. It has a search function which helps you to find the student or students in a particular class. You can also import and export students’ grades and email multiple students. It is the most innovative spreadsheet app exclusively designed for the iPad, iPhone, and iPod touch. With a few taps of your finger, Numbers app for iPhone lets you organize your spreadsheet in minutes with great looking charts, tables, images, and graphics. You can choose from over 250 easy-to-use functions including built-in help and can edit and enter numbers, dates, text, durations, or formulas with an intelligent keyboard. Numbers app helps you to make quick and easy sharable lists or calculations. The sheet navigator helps you to move easily from one sheet to another with tabs. Spreadsheets are stunningly sharp on iPhone 4’s high-resolution Retina display and the latest iPod touch. Numbers has Smart Zoom for viewing and editing data and when you edit or type data it automatically zooms in and when you are done it zooms back, this makes functioning with cells and text surprisingly easy on iPhone. If you are a teacher with an iPhone/iPad, then you should use these apps to get maximum out of your devices for your teaching work. If you use any other apps, then please have a say in the comments field below.